Were the winters when you were young worse than they are now? You may be able to prove it with the Twin Cities Snow and Cold Index. 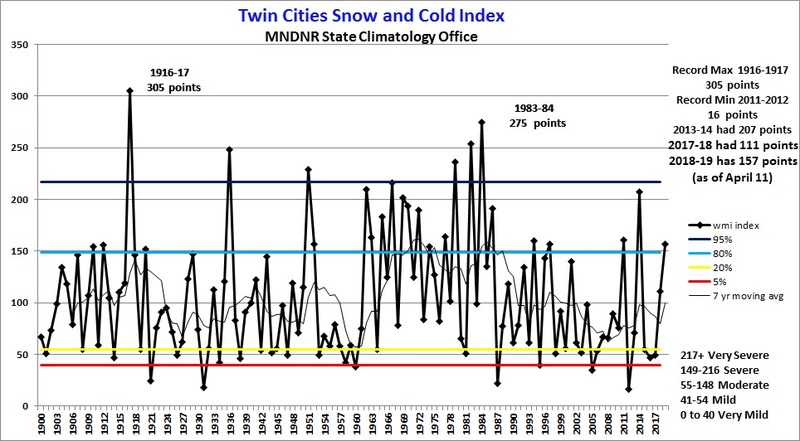 The Twin Cities Snow and Cold Index (SCI) is an attempt to weigh the relative severity of winter when compared with winters of the past. The SCI assigns single points for daily counts of maximum temperatures 10 degrees F or colder, and daily minimums of 0 degrees F or colder. If the minimum temperature drops to -20 degrees or colder greater, eight points are attributed to that day. Snowfall totals of one inch or greater in a day receive one point. Four-inch snowfalls generate four points for the day, an eight-inch snowfall receives a whopping 16 points. To quantify the duration of winter, one point is tallied for every day with a snow depth of 12 inches or greater. All current measurements are at the Twin Cities International Airport. A Year-To-Date comparison chart of the Index is also available. As of April 11, 2019 the SCI for the 2018-19 winter is at 157 points: 63 points for cold, 94 points for snow. This is enough for 2018-19 to be categorized as a "severe" winter. The SCI for the winter of 2017-18 finished with 111 points, enough for 2017-18 to be categorized as a "moderate" winter and higher than the long term medium of 89 points. The total SCI points for the 2017-2018 winter were 43 for cold and 68 for snow: 111 points. The SCI for the winter of 2013-14 in Twin Cities was 207 points, or in the high end of the "severe winter" category. This was the 9th most severe winter on record based on SCI points. The lowest SCI score was the winter of 2011-2012 with 16 points. The most severe winter is 1916-1917 with 305 SCI points. Note, this could also be called the "Winter Fun Index" depending on your perspective! The Midwestern Regional Climate Center offers an objective winter severity index called the Accumulated Winter Season Severity Index (AWSSI). The index quantifies relative winter severity for a number locations around the United States.